The Milwaukee County Zoo recently welcomed its newest resident, Genghis, a 13-year-old male snow leopard from the Como Park Zoo and Conservatory in St. Paul, Minnesota. The name Genghis may sound familiar to some Zoo guests since we also have a red panda named Genghis! Genghis, the snow leopard, is on display with our female snow leopard, 12-year-old Tomiris – and the two have quickly become great companions! Keepers will work on ultrasound training with Tomiris to monitor her for the possibility of cubs. 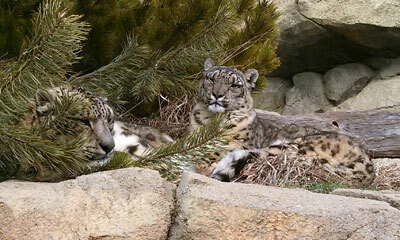 Although a first time pregnancy would not be common in a snow leopard of Tomiris’ age, keepers are very, very hopeful! Snow leopards live in the high, rugged mountains of Central Asia, with over 40% of the total wild population living in China. Since only 4,000 - 6,000 snow leopards exist in the wild, they are classified as an endangered species. Snow leopards have extremely long tails to help them keep their balance when navigating mountainous terrain. They also wrap their long tails around their bodies to stay warm in cold weather. A snow leopard’s hind legs are much longer than their front legs allowing them to launch extremely high in a single leap. You can see Genghis and Tomiris daily, in the Florence Mila Borchert Big Cat Country building.